Doncaster Rovers ran out deserved 3-1 winners against Darren Ferguson’s Peterborough United. Made a big save at the start of the second half to keep out Ivan Toney’s header when Posh were leading 1-0. Got forward to decent effect in the first half and delivered some useful balls into the box before making way for the more experienced Matty Blair. Quietly went about his business again at centre half as he continues to keep Andy Butler out of the side. Another impressive display. Mopped things up and read the game very well. Not as imposing as he can be going forward but showed some good touches and his corner delivery resulted in the first goal. Lacked nothing in effort but was denied the space in the middle of the park to really get his A-game going. Full of confidence. Showed typical composure on the ball, excellent distribution and the defensive side of his game is getting better and better. Busy performance, as per normal. Always looking to make things happen. Signs in the last two games that he is returning to top form. Kept fairly quiet on his return to the starting line-up but sent a few dangerous crosses over in the first half and showcased his trademark ‘chop’ before making way. His persistence paid off as he put a couple of bad misses out of his mind and was in the right place at the right time to score his 21st goal of the season. 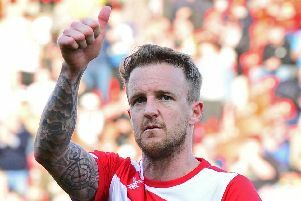 Doncaster’s joker in the pack revelled in another big game atmosphere. At fault for Posh’s goal, might have been sent off but was Rovers’ most dangerous player. Did well after coming on for Lewis at right back, providing fresh legs and some extra pace. Added a different type of attacking threat. Took his goal superbly well after getting in down the left channel. Might have added a fourth after being played in but was denied by Conor O'Malley. Louis Jones, Andy Butler, Tommy Rowe, Alfie May.